High-performing rubber and steel-backed wear liners. Engineered rubber and steel-backed wear plates manufactured with the highest performing rubber compounds in the industry offer outstanding abrasion, corrosion and impact resistance for moderate wear applications. CorroPlate engineered rubber wear liners are economical, high-performing general purpose wear protectants for tanks, sumps, screen chutes, hoppers, and launders. Corrosion Engineeirng’s proprietary rubber compounds offer maximum energy absorption, and resistance to tearing and abrasive wear. CorroPlate liners are formulated specifically for first-class performance and protection in applications exposed to high levels of wear and noise. Corrosion Engineering utilizes the best performing raw materials incorporating engineered compounds with excellent abrasion-resistant and impact-resistant characteristics. Our rubber compounds offer the highest tensile strength, exceptional elongation, and outlast alternative elastomers due to their superior physical and chemical properties. This translates into increased equipment life, and reduced total cost per processed ton. Standard rubber thicknesses typically range from 1/2 inch to 3-1/2 inch. For severe impact, such as found in coarse ore applications, thicker liners are available up to 12 inches thick. For sticky materials, molybdenum disulphide can be incorporated into the rubber to reduce adhesion and assist with release of the adhering material. Corrosion Engineering has the capabilities and experience to custom engineer our rubber compounds to suit your specific application. 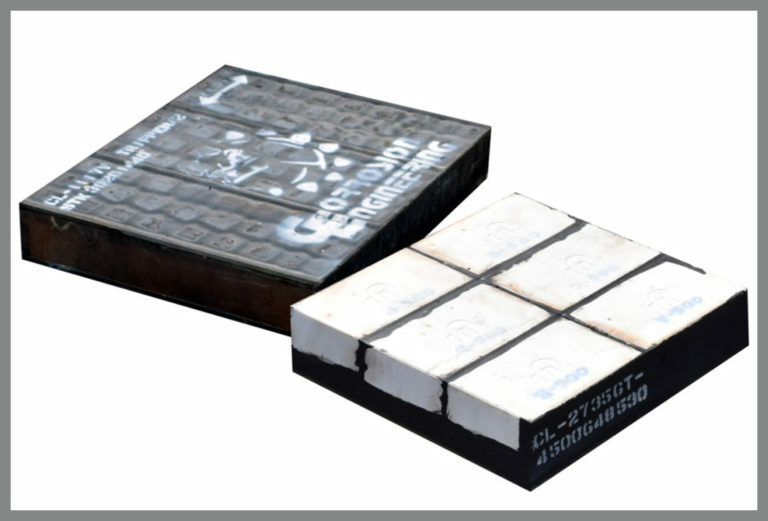 In the event of an application with extremely corrosive environments, our CorroPlate liners can be completely encapsulated in rubber to prevent corrosion of the backing plate. Corrosion Engineering studies every feature of the application to develop the most ideal, custom wear solution for maximum performance. The standard attachment system utilizes weld studs attached to the back of the backing plate. A variety of other attachment systems, including those that do not require penetrating the protected surface are also available. Corrosion resistant alloy fastening systems are also available. Our attachment systems are designed to allow for easy installation and removal of our lining systems. The exceptional impact absorption of CorroPlate liners dramatically reduces noise levels and vibration to improve working environments. Studies have indicated that CorroPlate rubber wear liners reduce noise levels by up to 85% as compared to conventional steel liners in the same application. CorroPlate rubber wear liners are excellent general wear protectants and are ideal for mineral processing applications such as Tanks, Sumps, Screen Undersize Chutes, Hoppers, Launders, Transfer Chutes, and more.